After deciding that a total renovation was necessary on their newly acquired 1950’s bungalow, Kirsty and James had the freedom to totally update their new home. The massive revamp of the property in Bridge, near Canterbury, turned it from a dated bungalow into a farmhouse style 4-bedroom home. 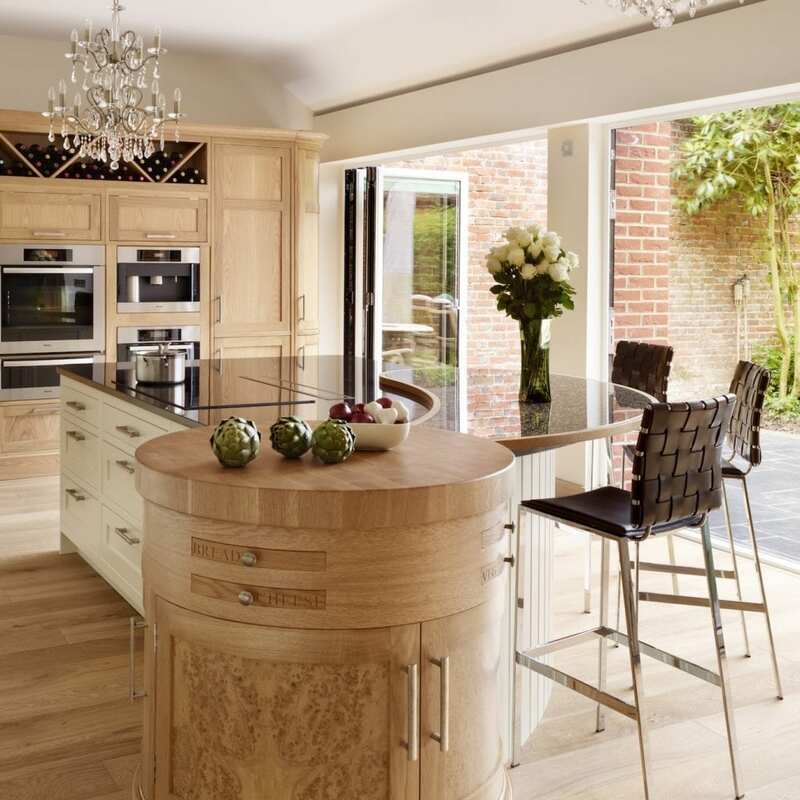 The focus of this renovation was the bespoke kitchen. Their previous kitchen was cramped, poor quality and very dated so Kirsty was excited about the prospect of planning her dream kitchen; “it was just so horrendous before that I wanted something really stunning this time round and to show it off to the max”. 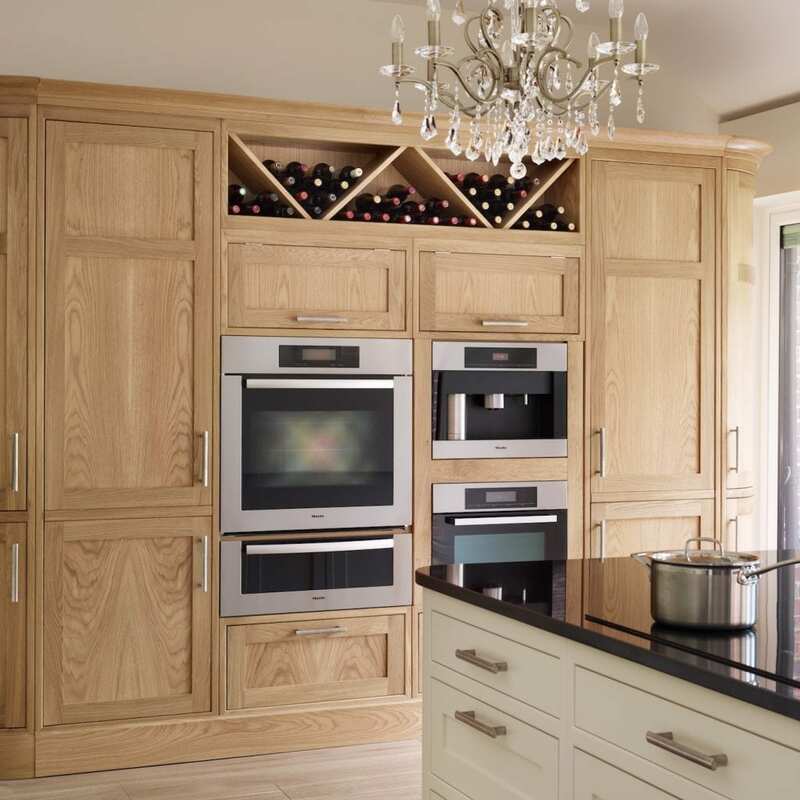 When Kirsty and James visited Davonport’s Colchester showroom following a recommendation, they were amazed by the quality of the kitchens, especially the curved cabinetry on display; “I instantly fell in love with the whole look of the place, the service and all the stunning curved handmade furniture”. Although Kirsty did not have a fixed idea for how the kitchen should look she did have a list of requirements. 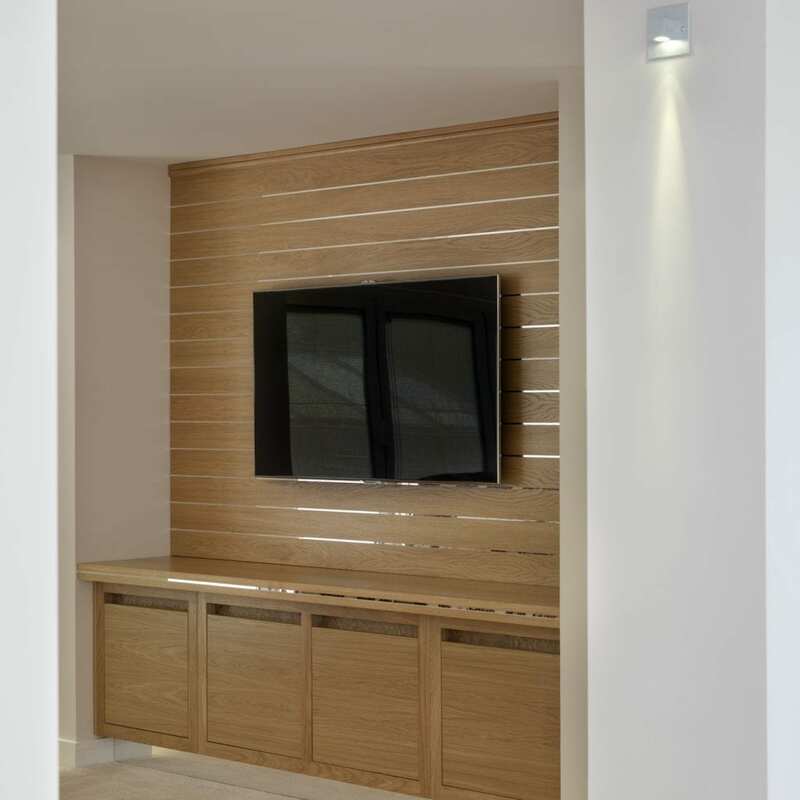 These requirements included; a light and airy atmosphere, lots of visible space, plenty of storage, and following their showroom visit; plenty of curved aspects to the design. The sheer size of the room meant that the light, spacious atmosphere Kirsty wanted was easy to create. 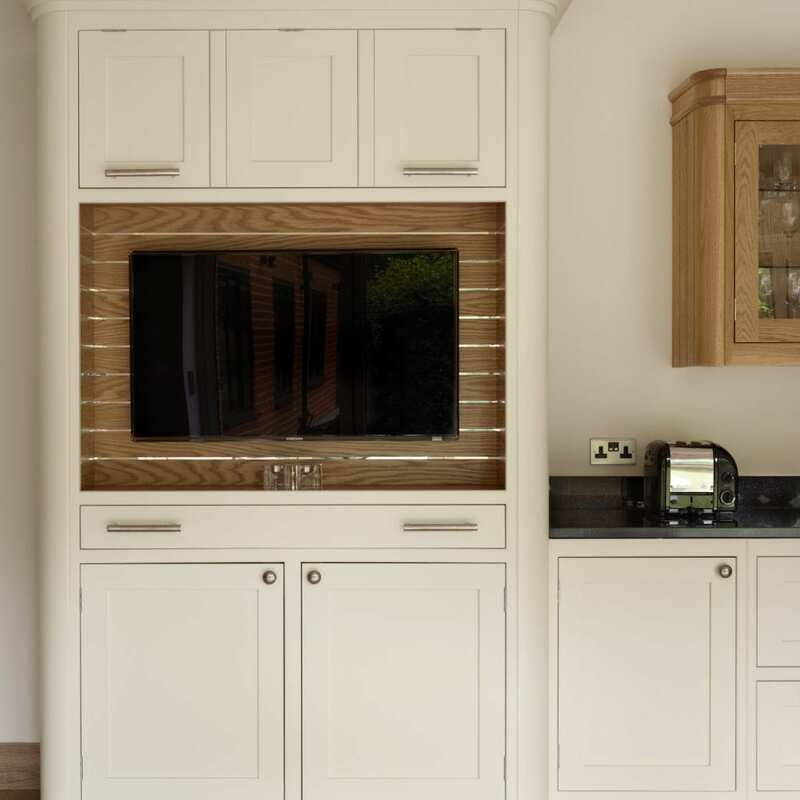 Kirsty liked the mix of oak and hand painted cabinetry, which also helped to achieve the airy feel that she was looking for. 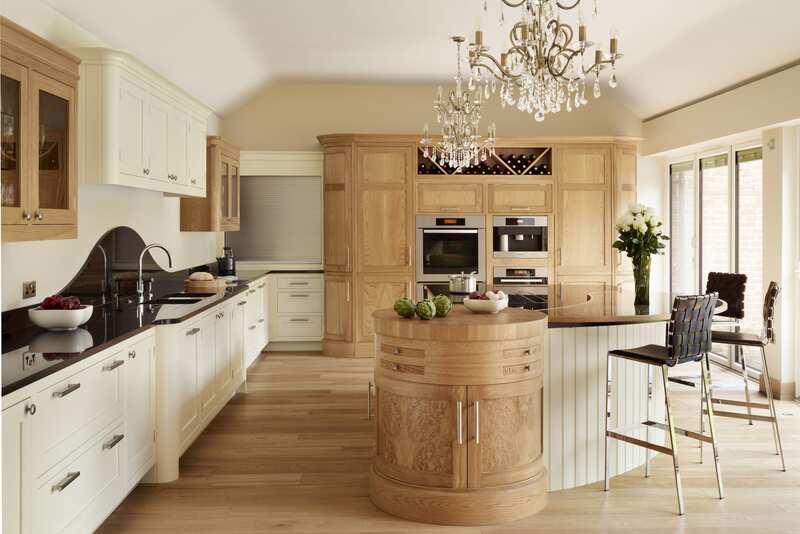 The cream used on the hand painted cabinets and the warmth of the oak bring a country-style to the room. 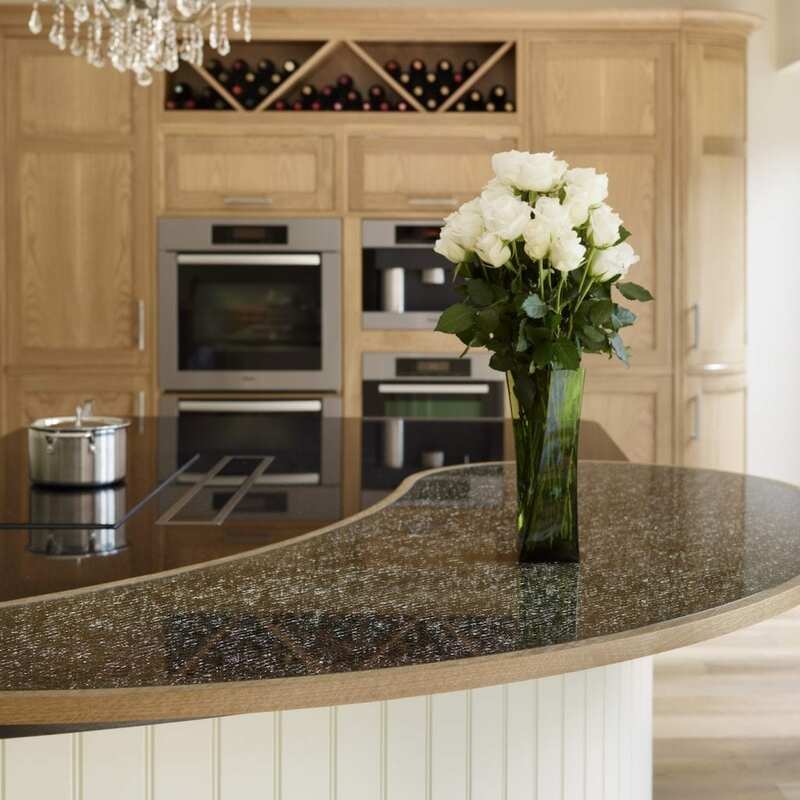 The luxury ‘Star Galaxy’ granite and ‘Cracked Ice’ worktops and splashback contrasts with the room’s light colour palette, adding a touch of glamour, further emphasised by the two chandeliers above the island. 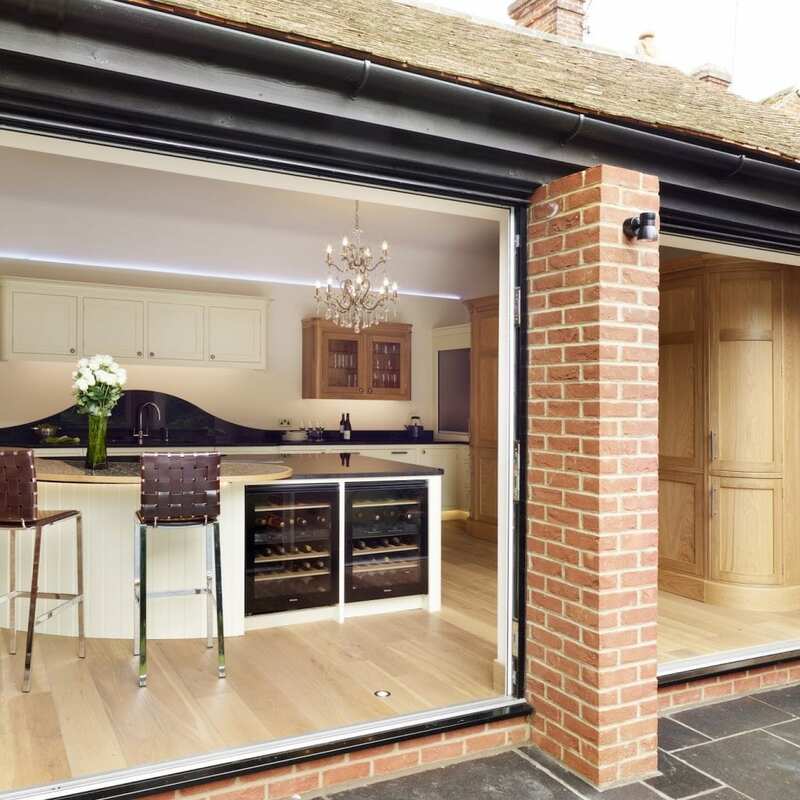 Despite the granite being very dark, the room maintains a sense of space and light largely due to the bi-fold doors leading from the kitchen to the garden, increasing the natural light in the room. 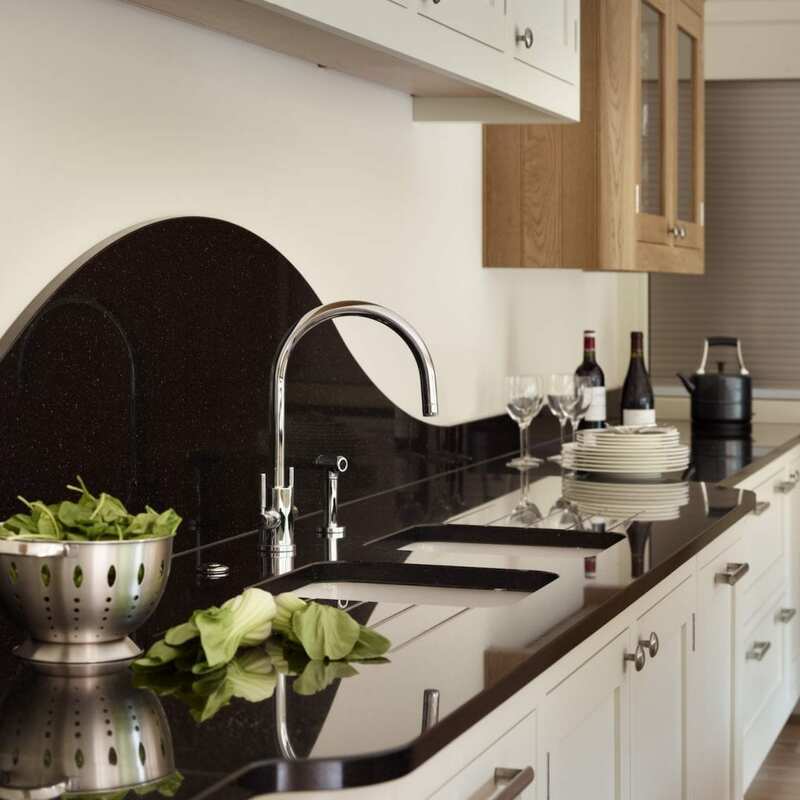 The curves that Kirsty liked so much in the showroom were beautifully applied to her own kitchen. 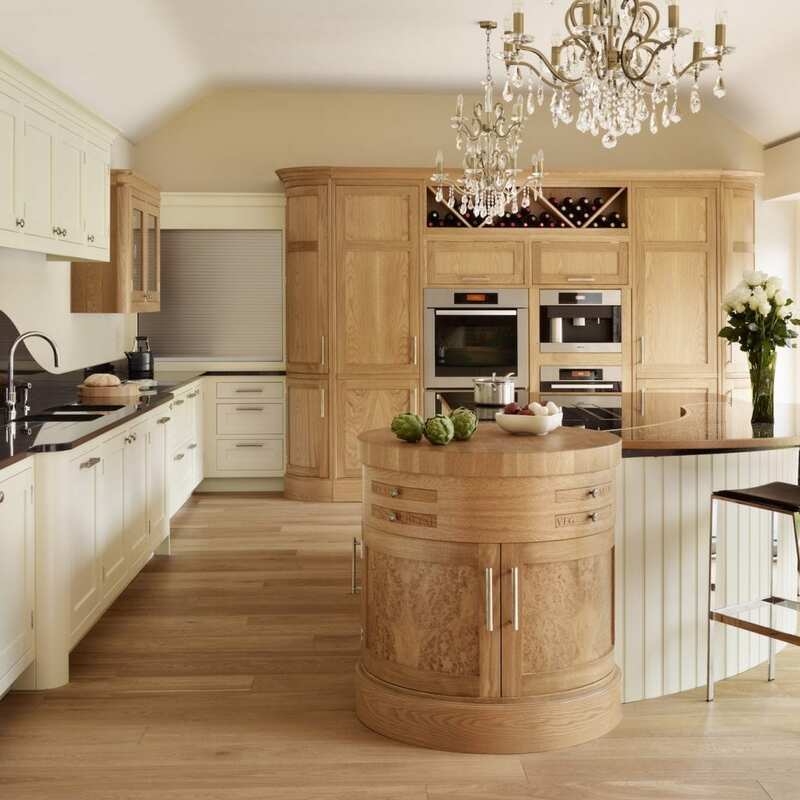 The round oak chopping block cabinet on the island sits alongside the curved breakfast bar, teamed with curved cabinetry elsewhere in the room and a wave like effect on the splashback. Using curves throughout the design helps to unite different aspects of the space and reinforces the opulent, glamorous feel that Kirsty wanted to achieve. Lots of cupboard space and somewhere to hide away clutter; two of Kirsty’s requirements, were both achieved by incorporating clever storage solutions. 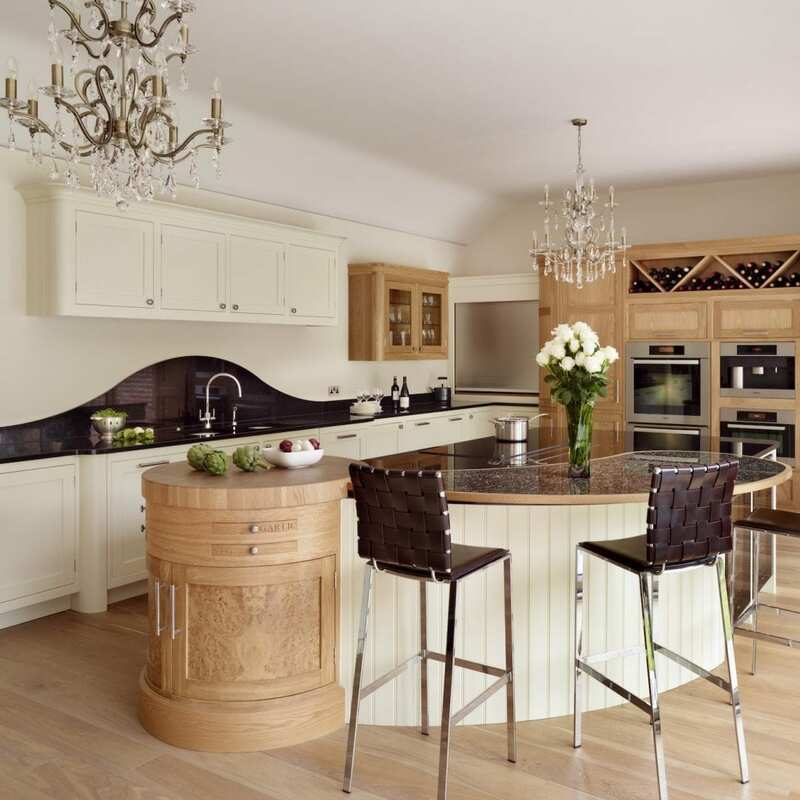 Floor to ceiling kitchen cabinets provided mass storage with a bespoke wine rack and twin Miele wine fridges built into the island providing additional space for drinks. The appliance garage built in the corner of the room was one of Kirsty’s favourite parts of the kitchen; “it means that the kitchen always looks tidy, it’s such a brilliant idea.” The roller blinds on the appliance garage enable small appliances such as the toaster, kettle and blender to be discreetly hidden. After months of planning, Kirsty and James now have a kitchen that looks and feels stunning, spacious and glamorous, ideal for when the family visit. “This is the place where we now spend most of our time and it’s perfect for socialising. 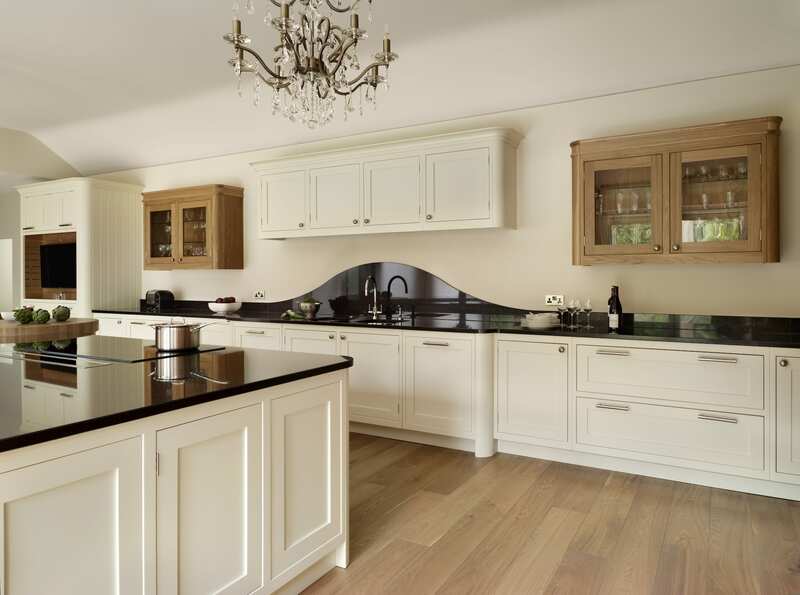 This kitchen is more than I could ever have hoped for and is undoubtedly the best room in the home” beams Kirsty.